Lots going on today. Well, of course there was the normal monday drudgery of getting back into the grind. I just plain move slower on Monday and so everything takes longer than normal. Go on over to see some close ups and what the rest of the fabulous DT created. 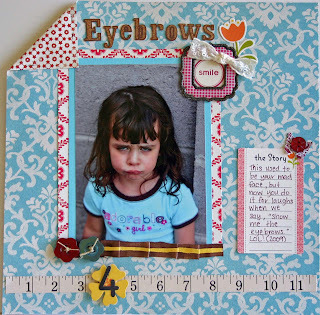 Remember, if you participate in the challenge you may get your layout featured on the blog and you get entered into the drawing for a free kit! This weekend was a long one. Little Miss attended two birthday parties. She has fun whether bouncing or sipping tea! And then on saturday night I went to a late night crop. 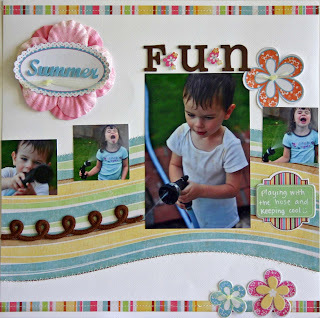 Lots of fun, chatting and even a little work on Create My Keepsake's July kit. Here are 2 more layouts from there. i just love those pages! you did an awesome job with the CMK kit! Love your layouts Rebecca! And the new blog looks great too! Very cute pages! And I love the new Blog look!